It’s a very entertaining moment when your boss tells you that you do not blog often enough, and that he knows this because his Mom told him. It’s also rather entertaining when you try to explain to a group of your co-workers as you all gaze at calendars and try to hash out the schedule for the year that you’d really like to move a large weekend to a different weekend because that day also has a knitting convention in Frederic, WI and you happened to mention to your boss’ mom that perhaps you could get that event date changed this year. Somehow my boss wasn’t willing to rearrange his weekend away for a knitting thing. Go figure. I’m not sure that the poor man knew what he was getting into when he hired me! Perhaps I wasn’t clear that I was a Knitter with a capital K.
Today at lunch with several members of the staff I tried to explain what I had done with my July sweater last night. It was around 11pm when I realized that I had put in an extra yarn over in several rows down. I was tempted to rip back to the offending section, put everything back on the needles and then re-knit the whole thing. However, making decisions at 11pm when you’ve had a long week is generally a bad idea. Wisely I stopped myself from throwing it across the room and set it aside to go to bed. This morning I looked at the sweater again. The offending section was still there. Darn! I double checked to make sure tthe only mistake I had was the one extra yarn over. I dropped the 5 stitches that comprised that repeat down several rows and started re-knitting the repeat. I’ve got one row that seemed a little loose, but I think as I block the sweater it will blend in. As I was explaining this to my co-workers, I realized they had no idea how tricky this was. What to compare it to? Wine making? No, not really any way to adjust that as you go. Thinking on your feet when a key volunteer doesn’t show up at one of our biggest events? Close, but knitting doesn’t involve quite the same amount of stress and adrendaline that running an event does. Cooking…. maybe. So I compare it to when you’re part way into a recipe and you realize that you don’t have enough of a key ingredient to make the recipe. You’ve already put sugar and eggs into the mixer and all of a sudden you realize that you need self-rising flour and all you have is all purpose. So you whip out the cookbooks and search the internet until you find that all you need to do is add baking soda, baking powder and salt. Recipe Saved! I’m not sure that my co-workers bought it. But hey, the let me knit at lunch with them without being too embarassed by me, so they’re pretty cool. And they really tried to understand my story. Yeah, I love my job. I leave you with a random picture of a baby hat I knit for a friend’s new baby. 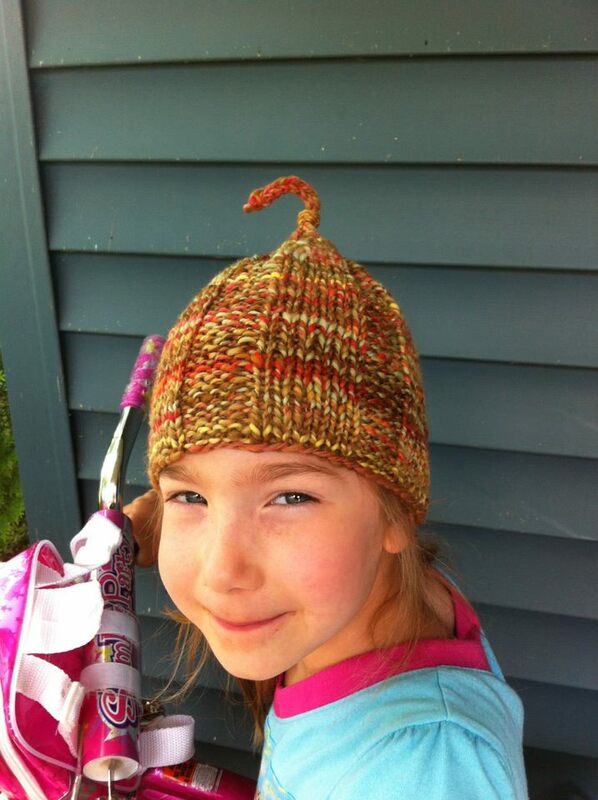 Lily agreed to model the hat since she has the smallest head in the family. She insisted upon having the picture taken while sitting on her bike on our front porch. On one of the hotest days of the year. I got your text yesterday…didn’t have a chance to take a picture of the mits but I will get it to you this week! Glad you are back blogging! I love your new job too!